I stayed up to “too early” one morning, watching the movie The Exorcist, while hanging out with an adorable cupcake-scented unicorn named Kissymuzzle. Her wide-stitched eyes poured over the movie which I had on in the background as I read a recent skirmish-of-words about reconstructionism and spirit work. I love a good classic movie, and I had forgotten how intense this one was, from the scene where the little girl is traumatized by well-intentioned people who put her through a spinal tap, through the scene of demon-induced guacamole-colored vomit. In between listening to English-spoken-backwards and the cries of a helpless mother, I read comment after comment of people communicating completely past one another and evading actual useful concerns. There were some missed opportunities here in conversations about reconstructionism and spirit work in polytheist settings. Both viewpoints in the conversation that I read online had valid, important matters to discuss. Both viewpoints (which are not always separate and need not be separate) had deep concerns, which potentially support and enhance each other. Reconstructionism, a useful way to honor the deities, relies on researching the cultural, religious, social, temporal, and local contexts that a deity was once worshipped in, as best we can within the limits of scientific and academic disciplines. These disciplines provide extensive, vast, and multifaceted information. The information available is just as limited as it is vast and just as vast as it is limited. A person employing a reconstructionist methodology will use this information to provide better structure and context in which to honor the deities and make up for the structures and contexts which have been lost since antiquity. In regards to research and academia, certainly we human creatures get things wrong from time to time but we also get things right, or at least not completely erroneous, often enough. Reconstructionist methods are particularly useful because if we know a deity valued or preferred something in the past, the chances are that the deity will still value or prefer the same or similar in the present. Despite the critiques of reconstructionism very few people who engage in reconstructionist methods actually believe that they are engaging in worshiping the deities exactly as it was done in ancient times, or believe that this is possible when it is not, nor do they typically want to regress and push civilization and technology backwards. We do not live in ancient times, and we cannot pretend that we do—and most who employ reconstructionist methods have no illusions that this could be done or is that it would be desirable. Despite the critical refrains from others, only a few who engage in a reconstructionist methodology would actually want to bring back entire ancient cultures wholesale, or demolish modern technology, or both. Some folks who rely on reconstructionism may sometimes employ in rites activities that look like or are much like reenactment, while many others do not. Full-scale reenactment of some sort is not at all required or necessary, and isn’t something that happens all that frequently. Also, many people who use reconstructionism do not engage in rites which are sometimes compared to Civil War reenactment weekends or live action role playing games. * Sometimes some rites (not always and not all rites) can end up devoid of the very deities folks claim to honor, and the rite can end up being more like a pageant put on for other people rather than an actual rite to honor the deities. When this happens (and it does happen sometimes, not all the time and not all rites, and not all rites that are heavy on pageantry), then the critique that a rite is more like theater with props and acting and less as an activity that honors the deities, is apt. Yet it is helpful to keep in mind that this concern is not just limited to reconstructionist-based rites. Some critics worry that the structures created using reconstructionist methods are stagnant and dead and inflexible, or that the rites are little more than empty theatrics, or that people who employ the methods want to live in a fantasy-land of the past. Although these things are sometimes true, they are not always true. Is the concern that these things can happen valid? Yes, absolutely, but it doesn’t happen all of the time in all rites and with all people who employ a reconstructionist methodology. There are many ways to engage in spirit work and many different activities can arguably fit under this category—activities anywhere from a skilled divination reading, to trance and possession work, and many more. I’ve seen increasing pressure on individual polytheists or assumptions that a polytheist must be a spirit worker. This isn’t true: not every polytheist must engage in spirit work—it is by no means an expectation or a prerequisite to honoring the deities and should not be assumed as such. It’s totally ok and normal not to engage, or want to engage, in spirit work, just as not everyone who employs a reconstructionist method could, would, or can learn an ancient language. Different folks have different skills sets, talents, inclinations, and strengths. Not everyone has to do spirit work, and not everyone who engages in some form of spirit work engages in or is skilled or knowledgeable about other forms of spirit work. Experience differs greatly and across different skill levels and different talent levels, different groups, different individual people, different modalities and systems, and connection with beings or Beings. Spirit work, because it can provide a direct communications with the deities and the ancestors, is an important part of engaging with the deities and of restoring our veneration of them. Critiques about spirit work include “it’s all faked,” or “it’s not what the ancients did.” Many, if not most, of us have seen spirit work gone amuck, and sometimes this occurs from lack of discipline or structure. ** There is a lot of stuff that passes as spirit work which is done with little to no standards, without a check and balance, or without an unbiased second opinion—it’s sometimes not as easy in our circumstances to fact-check spirit work as it is to fact-check history. Also, our spirit work traditions are broken: we struggle to reclaim them, haltingly, fumblingly, and we struggle to find language to express these matters. Sometimes, unfortunately, some folks take an easy way out of assuming a level of competence and relativity where “each person does it right for them, no one can do spirit work wrong” when this is not the case. An observer can easily take one glance at these problems and a proliferation of awkward spirit work, and assume that it is all the same and all poorly done. Many activities included in spirit work are indeed what the ancients did. But sometimes (not all the time, just sometimes) the manner of going about doing these activities can differ today from what was done in ancient times. If there is evidence that a deity has demonstrated that the method of communication is accurate, real, and appropriate, then this is acceptable to that deity in that situation. The critique of “all spirit workers have an ‘anything goes’ mentality” comes into play here. Some spirit workers may have this attitude and problems can result, so in some situations these concerns are valid, but not all the time always with all spirit workers and all spirit work. Also, just because an observer isn’t aware of the rules, the structures, or the disciplines, it does not mean that there are no rules, structures, or disciplines. Furthermore, critiques are heaped on spirit workers as a group—and a very diverse non-cohesive group at that—as a blanket whole. Some critics accuse some spirit workers of living in a fantasy land of their own mind; although this is sometimes true it is not always true. Is there bad spirit work? Yes, absolutely, and concerns are, but it is not all spirit work all the time everywhere with every spirit worker that is problematic. A person who employs reconstructionist methods but completely discredits spirit work, or a spirit worker who completely dismisses reconstructionist methods, are both run a risk of missing an opportunity to address very real and useful concerns. One who leans more towards a strict reconstructionist methodology is often concerned about structure, discipline, standards, and making certain that the deities are honored appropriately. Where spirit work falls short, or is less-skilled, reconstructionism is one technique which can help provide correction. For instance perhaps an inexperienced spirit worker suggests to me to make an offering of pork to a Canaanite deity. I know from research that the Canaanite deities do not receive pork as an offering, and a broader cultural reference flags this as potentially insulting. Thus reconstructionism just provided a useful check and balance. Also, if one doesn’t have much experience working with a particular deity or access to spirit work or a spirit worker, reconstructionism can provide an excellent default setting that helps a person make one of the best approaches possible towards particular deities and ancestors. Because I may not know the level or quality of work a person claiming to do spirit work actually does, I will often quite strongly suggest utilizing the standards uncovered through reconstructionist methodology. Reconstructionism is among the best methods to actively honor the deities well, especially for a layperson and / or a person who does not engage in spirit work and /or a spirit worker who is experiencing fluctuations, difficulties, or shifts. What spirit work can gain from reconstructionism is structure, discipline, a greater depth of context, and a deeply rooted connection to that-which-came-before-us in time and space. A spirit worker often wants ensure that the deities have the opportunity to interact with people as they chose to instead of being treated as fossilized remnants of a bygone era. Spirit workers typically have concerns that some reconstructionist-based rites can become stagnant or be simply a pantomime without depth and substance. What reconstructionism can gain from spirit work is the opportunity to experience the deities’ presences, and to engage with the deities and ancestors actively. Sometimes there are gaps in research and errors, misinterpretations, mistranslations, or misrepresentations. 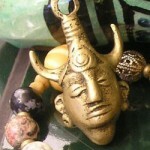 Spirit work can help add the guidance of the deities and the ancestors themselves to correct these problems. Spirit work also helps deepen the relationships of people with the deities in the modern day—and this is vital if we are to continue to honor the deities in the modern context that we are in and to ensure that these ways endure. Both spirit work and reconstructionism add meaning, depth, value, and usefulness. We require both skill sets and the wealth of talents of the people who employ them if we are to revive the veneration of our many deities. This is an “all hands on deck” situation, what with the degeneration and destruction that our polytheistic ways have suffered through the centuries. Both spirit work and reconstructionism ideally are ways to make certain the deities are honored well and appropriately: this common goal is the most important goal of all as we re-learn how to engage with our many deities. Reconstructionist methods provide a cup—not the only cup, but a very good, very useful and appropriate cup—while good spirit work provides the wine. A cup, a structure of some sort, is needed to drink the wine, otherwise the wine spills. A cup without the wine, spirits, is empty. When one person says “wine is better than cups,” or “cups are better than wine,” one is missing the point, and likely missing out on a good drink. * There is nothing wrong with either U.S. Civil War reenactment weekends or live action role playing games—neither of which are the same thing, and neither of which are polytheistic religions. However, sometimes this comparison is apt especially where acts of devotion are little more than elaborate theater; and sometimes it is not apt. I caution against using the term “LARPer” specifically as a silencing, derailing, and/or discrediting tactic towards not just those who use a reconstructionist methodology, but to those who do not use a reconstructionist methodology, and to those people who are polytheists and actual LARPers as if a LARPer could not distinguish her religion from her gaming. (I’ve seen LARP-comparisons used as a derailing tactics in all three circumstances.) To use the term “LARPer” as a tactic in polytheist conversations can potentially reinforce bad stereotypes around LARPing and, more importantly in this context, also shut down what might be a useful conversation amidst polytheists. I object where the term is used as a derailing tactic, or a tactic meant simultaneously to end conversations and discredit the other party in the conversation, or both. It reminds me of how the term “fluffy bunny” is thrown around in some Pagan and New Age conversations as a similar tactic. This term and comparison is not always used in the manner of bad tactics and as such it is fine, but when it is used as a silencer we need to be observant and mitigate foul play in otherwise constructive conversations. **Not all undisciplined spirit work is necessarily bad spirit work; not all unstructured spirit work is necessarily bad spirit work. Sometimes things just crop up spontaneously—such is the nature of spirits. However discipline, or structure, or both, tend to yield useful results, and working without them can be a risky, even dangerous, act beyond what is already a risky venture. Bravo. I think it is important to strike a balance as much as one’s talents and inclinations allow. This is especially true in Gaulish Polytheism, where we simply don’t have enough to engage in strict reconstructionism, but where a balanced measure of it, especially linguistic reconstructionism, can eeply enrich out practice. Shalamu, Tess. I found this post very helpful in what it speaks to. For myself, I’d been torn between following a polytheistic path and yet not feeling the call to spirit work. Probably others already know this, but one does not automatically imply the other. At this time, I find my path is more toward daily devotions to them. May the Gracious Deities stand with you. Peace!